A you may or may not know, the federal stimulus package includes funds for high speed rail development between Buffalo and Albany. 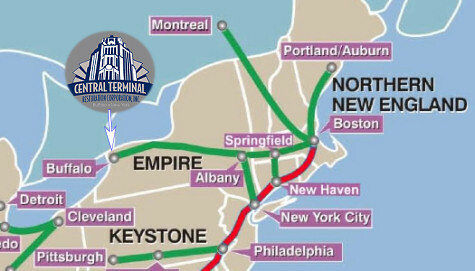 There is also growing support from local, state and national politicians to have the Central Terminal as part of the mix on the western end of the line. As of late, US Senator Gillibrand has now taken an interest in the concept. In a letter to Senator Gillbrand, Mike Miller, President of the CTRC, makes the case for B-F’s much beloved Central Terminal…great letter MIKE! Any more Artemis and the Stag sculptures in the closet? It IS an excellent letter! Kudos to Mike Miller and all the folks at the Central Terminal Restoration Corporation!!! May all your dreams come true!